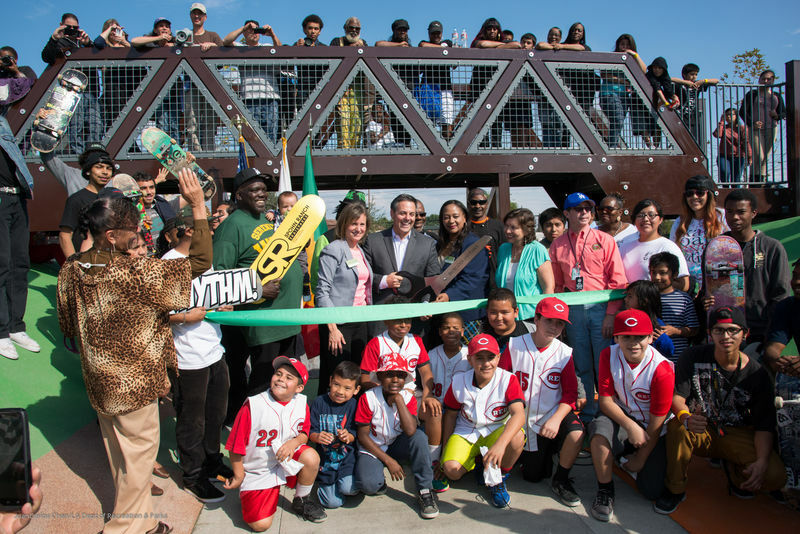 Carla ColemanPhoto credit: Los Angeles City Councilmember Joe Buscaino at the ribbon-cutting for Watts Serenity Park. For decades, 1.13 acres of land on Monitor Avenue in Watts lay vacant, overgrown with weeds and strewn with garbage and broken glass. When plans for a housing development fell through, the prospect of giving local children and their parents a safe, welcoming place to meet and play motivated neighbors to step forward and support the creation of a community park. Local residents actively participated in the park planning process. At a series of community workshops, they suggested special features and helped to refine and shape their initial input into a coherent concept for the entire park. Called "Monitor Avenue Park" during its construction, Watts Serenity Park, which opened in January 2015, covers barely more than an acre—but its importance to the neighborhood is out of proportion to its size. To make the most of the space, The Trust for Public Land worked closely with the community to build the features that people wanted most. The final design includes play equipment for kids, a Fitness Zone® exercise area for adults, and a skate park. His entire life, Kartoon Antwine has lived across the street from a vacant lot filled with trash and towering weeds. As residents of Watts, one of the most park-poor areas of Los Angeles, Antwine and his neighbors don't have a single green space to call their own.